If you get the feeling that heavy downpours are more intense than they used to be, you’re not imagining it. 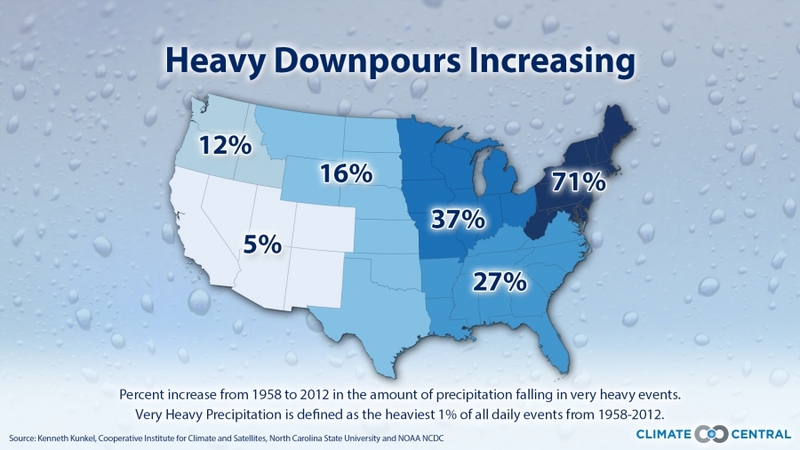 According to the National Climate Assessment, the most extreme precipitation events (those in the 99th percentile of intensity) have increased in every region of the contiguous states since the 1950s. As the map above shows, the rise in intensity has been greatest in the Northeast and least in the Southwest — and in all cases, climate scientists believe, the reason is simple: in a world warmed by heat-trapping greenhouse gases, there’s more evaporation, and the atmosphere can hold on to more water. And when that water vapor condenses as rain or snow, there’s more of it. Note: This graphic was updated to include the new data released in the final National Climate Assessment. The previous graphic was based on the draft data.